Youtube. Magento. Tripadvisor. Alibaba.com. These companies are using the service of Gengo, namely translations powered by its community. This platform provides professional human translation service and has completed already one million translation jobs. 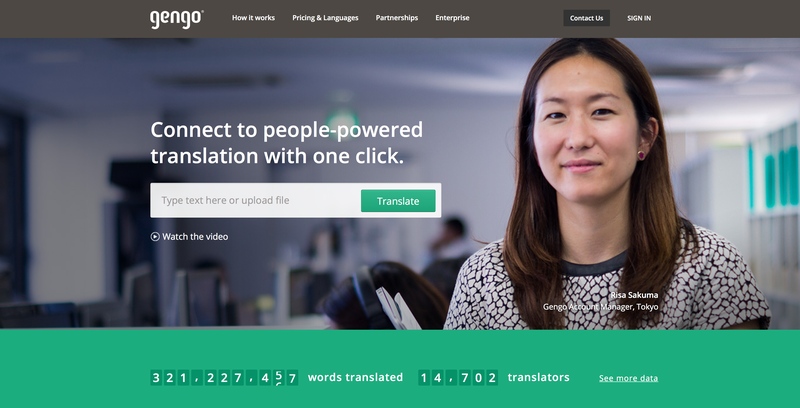 Founded in 2008 and by the end of 2013, Gengo has translated 150 million words. Everyone can join the community and sign up as a translator. Currently, 34 languages and 58 language pairs are available to bilinguals with a network of 14,702 translators across 114 different countries. Gengo makes it very simple for diverse companies to integrate high-quality language translation through an API. As a homeworker, it is very easy to connect to Gengo and begin translating as a freelancer. The platform allows translators to work and manage their own time similar to Uber. Another neat feature is the education of beginning translators in order to increase the overall quality. In general, Gengo delivers a strong message and an innovative service. This blog continue s the awareness of crowdsourcing and the sharing economy. Like Uber, Gengo is a gamechanger by making an impact in the translation world. Not to mention, this company has already collected $ 24.2 millions from 23 investors. People-powered translation lowers the barrier to make an impact in the society by translating texts. However, there are some disadvantages. Until recently, translation crowdsourcing already exists that is merely on voluntary basis for NGOs. Here comes Gengo, which mediates between the supply and demand of translators. They aim to turn it commercial and make translations affordable for companies. All bilinguals can join as a translator very easily without prior qualifications. But the most interesting part is the differentiation of ‘pro’ translators and ‘standard’ translators. The firm describes the pro level where accuracy is key whereas the standard level is focused on non-critical texts, such as blog posts and articles. Likewise the pay rates are differentiated. Usually, a professional translator asks $0.25 per word, but the pro-level and standard-level translators from Gengo receive $0.08 and $0.03 per word respectively. The workload and the related pay rate are perceived as unbalanced since many reviewers on Glassdoor.com have complained about the unreasonable pay compared to their effort. Basically, Gengo enables businesses to scale quickly and to connect with a global audience. The platform let translators easily read and translate with one click. Not only the ease of the platform is important, the quality of human translation makes the texts easier to comprehend and more natural to read. Yet, the translators feel unsatisfied with their compensation. All thing considered, would you join as a Gengo translator? Hennes & Mauritz, better known as H&M, is a Swedish multinational retail clothing company that most probably does not need an introduction. It was founded in 1947 and is still very successful worldwide, mainly due to putting all of its customers central. H&M’s online presence in terms of a web shop, a smartphone application, and several social media accounts plays a major role in H&M’s success, as this has enabled H&M to continuously observe and interact with its customers. The 31st of March, H&M will come with something new to take its customer relationships to the next level. Namely, it will introduce a digital customer loyalty program in the Netherlands. This will make the Netherlands the second country in the world with a H&M loyalty program. According to the country manager of H&M in the Netherlands, this move is now made in order to capitalize on the relatively high amount of online orders of customers in the Netherlands. The past years loyalty programs have become more and more digitalized. The non-digital loyalty programs involved getting stamps for every €5 spent. They evolved into digital loyalty programs with member cards that had to be scanned after every purchase in order to receive loyalty points. Currently, there are loyalty cards that have to be connected to an online account to collect customer demographics information. Clearly, loyalty cards came into existence to bind customers to a certain business. Over the years this mindset has changed, and at this time businesses primarily want to have as much relevant customer information as possible to be able to better adapt their products and deals to their customers. H&M is taking a slightly different but more advanced approach with its loyalty program ‘H&M Club’, by integrating a customer loyalty card in the H&M application. Joining the club is free, and when one has joined the club, he or she will receive one point for every euro spent, in addition to 50 free “welcome points”. The points can be redeemed for weekly changing discounts, but more importantly, these points can also be exchanged for access to exclusive events. Customers are given the opportunity to attend designer events in cities such as New York or Paris, be present during H&M photoshoots, or get a guided tour at H&M’s headquarter in Stockholm. This method has been selected because it is more sustainable not to have an actual member card, but the main reason is that customers are demanding more and more engagement and transparency from H&M. H&M’s loyalty program seems to be a promising addition to H&M’s existing business model, especially since it offers its customers the opportunity to increasingly engage with the brand. The free welcome points give the customers a head start which may lead to a greater use of the program, as the rewards become easier to reach. Furthermore, points can be redeemed in different quantities, depending on the chosen deal. Moreover, the discounts and events offered by the H&M Club are most likely treats that customers would not spend their own money on and can lead to customers buying things that they would not have considered buying before. The previously mentioned components of the H&M Club have been cited by scholars as important levers of loyalty (Nunes & Drèze, 2006). Based on this and H&M’s long-term success, its loyalty program is likely to succeed. Nunes, J.C., & Drèze, X. (2006) Your Loyalty Program Is Betraying You. Harvard Business Review, 84(4), 124. As you guys might have noticed last Sunday the 46th Super Bowl was won by the New York Giants (GO GIANTS!!). They won the 46th NFL Championship against the New England Patriots with 21 against 17. Well, pretty interesting and all that..but the reason I’m writing this post is because I’d like to share a really great commercial with you. I think a lot of people know the Super Bowl for two things; the half-time show and the incredible amount of commercials (and advertising expenditures, an average of $3.5million per 30 seconds of a commercial). GM (General Motors) came up with the idea to invite everyone to create their own Super Bowl commercial for Chevrolet and the winner’s video or idea would actually be used as the 2012’s Super Bowl half-time commercial. The winning one is this hilarious commercial created by Zach Borst, a 26 year old student/filmmaker from New York. Check it out.. I haven’t seen all commercials, only looked up the car commercials and the Chevy one I think is the greatest, but here are two other ones that really give you an idea of how serious these Super Bowl commercials are with regard to the marketing budget as well…the first one is a pretty impressive one created by the Chrysler Group (with GM and Ford they form “The Big Three” car producers based in Detroit) starring Clint Eastwood. Take a look..